General Elections in Austria: another grand coalition? 6.5 million Austrians will be renewing the 183 members of the National Council (Nationalrat), the lower chamber of Parliament on 29th September next. Will Chancellor Werner Faymann's Social Democratic Party (SPÖ) and the People's Party (ÖVP) led by Vice-Chancellor Michael Spindelegger who have governed the country since 2006 continue with the grand coalition? This is the focus of this election. If they do not win an absolute majority the next government may comprise three political parties. A coalition would however be difficult to form, since the SPÖ is against any cooperation with the Freedom Party (FPÖ) on the far right led by Heinz-Christian Strache - with the same applying to the Team Stronach for Austria formed by Austro-Canadian businessman Frank Stronach. The Greens, led by Eva Glawischnig Piesczek, refuse to govern with the ÖVP. Michael Spindelegger qualified the formation of a three party government coalition as "dangerous". The arrival of the Team Stronach in the political arena adds additional uncertainty to the elections. This party is attracting discontented voters but for the time being it is refusing any alliance with the government parties. Just one month before the election the continuation of the SPÖ-ÖVP coalition does seem to be the most likely configuration however. In a survey by Spectra two-thirds of the Austrians (67%) said they preferred to be governed by a two party coalition. The continuation of the coalition won 34% approval; 18% of those interviewed supported a coalition including the SPÖ and the Greens and 11% preferred the ÖVP and the Greens. 27% would like to see a three party coalition. In this case one third of those interviewed would like to see a government led by the SPÖ, the ÖVP and the FPÖ. Since the end of the Second World War Austrian political life has been dominated by two parties: the ÖVP and the SPÖ which formed on the basis of two divisions: religion (the ÖVP is the successor to the Catholic Social Christian Party, which was extremely close to the Catholic church) and social class (the SPÖ is the successor to the Social Democratic Workers' Party). In 1975 these two parties together represented 93.4% of the vote; 84.4% in 1983 but only two thirds of the electorate in 1995 (66.6%° and slightly more than half (55%) in the last elections on 28th September 2008. In spite of this continuing erosion the Austrian political system is still one of the most structured in Europe. The ÖVP rallies the majority of the middle class whilst the SPÖ wins the votes from most of the workers and employees. Moreover one third of the electorate of each of these parties are members of the party which they support with their vote, i.e one of the highest membership rates amongst the Western democracies. Austria, which until 1966 was governed by grand coalitions that rallied the ÖVP and the SPÖ functions according to the Proporzsystem, which is a corporatist system based on compromise and the sharing of power between the two main parties as well as on cooperation between the unions and the employers. This system was key to the return of social peace and stability. One party governments were formed in the 1960's without this impeding the continuation of the corporatist system. In the 1980's two phenomena modified the Austrian political landscape: the emergence of new parties (notably the Greens) and the renaissance of an old party which had remained a minority for a long time, the FPÖ, formed in 1956. After this the two "main" parties lost ground witnessing a collapse of their membership numbers as well as votes in their support. The downturn in electoral turnout has accentuated this trend. The political scene has therefore become unpredictable. The FPÖ, which was excluded from power for a long time gained access to public funding in 1975 and entered government in 1983 (in coalition with the SPÖ). In 1987 the SPÖ-FPÖ coalition returned to power. Led by Jörg Haider who opposed any kind of repositioning, the FPÖ grew more radical and opposed the two main parties. Ten years later, riding the wave of the electorate's discontent, it had more votes than the ÖVP and returned to power in 2000 in a coalition led by the ÖVP and Wolfgang Schüssel. The Greens' breakthrough can be explained by the spread of post-materialist values and by the concomitant decline of traditional partisan affiliations. The Green electorate is mainly female and educated, i.e. almost the exact opposite to the FPÖ. Recent political changes in Austria are also linked to the socio-economic context (liberalisation of the movement of capital and European integration). The Austrian parliament is bicameral. The lower chamber, the National Council (Nationalrat) brings together 183 MPs elected for five years and the Federal Council (Bundesrat), upper chamber, rallying 64 representatives of the country's 9 Länder. The members of the National Council are elected by a majority vote in Vienna and in the Land of Vorarlberg - and in the rest of the country the vote is proportional within constituencies comprising the Länder, divided into 43 local constituencies. A party has to win at least 4% of the votes cast or win a direct mandate - i.e. around 25% of the vote in one of the 43 local constituencies - to enter parliament. People have two votes: one vote is for a party nationally and the other is to appoint a candidate in a local constituency. It is obligatory to vote in four Länder: Carinthia, Styria, Tyrol and Vorarlberg. Each town decides the time when the polling stations open and close. The parties which have less than three seats in the National Council must gain the signature of at least 2600 voters if they want to take part in the elections. These signatures must be collated across Austria as a whole: a minimum of 500 in Lower Austria and in Vienna and 400 in Upper Austria and Styria, 200 in Carinthia, Tyrol and Salzburg and 100 in the Burgenland and Vorarlberg. The Bundesrat represents the Länder. Each Land is administrated by a government (Landesregierung) and a Diet (Landtag). The Länder are competent in all areas which are not the direct responsibility of the Federal State: urban development, environmental protection, transport, urban planning. Each Land elects (in a proportional vote) a number of representatives to the upper chamber which is proportional to its population (at least three). 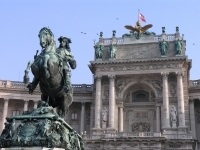 Vienna, which is the most populous region has 12 representatives. The Presidency of the Bundesrat is the responsibility of a different Land every six months, succeeding each other in alphabetic order. Since September 2008 every Austrian aged 16 and over is allowed to vote in the elections. The 2008 election did away with the belief which deemed that the youngest tended towards a vote for the left. Indeed post-electoral surveys showed that 43% of the 16-29 year olds voted for the FPÖ (25% of the 16-18 year olds). The youngest also quoted the immigration (32.3%) as the main issue in the election, ahead of education (23.7%). According to the polls young people's mistrust of the traditional political parties is still rising. – the Greens (DG), founded in 1986, led by Eva Glawischnig Piesczek, with 19 seats. Austria is in relatively good economic health. The country is the fourth wealthiest in Europe and has indicators over the European average in all sectors. GDP growth lay at 0.7% in 2012 and is due to increase by 1% this year. According to forecasts the GDP is due to grow by 1.7% on average between 2014 and 2017. The budgetary deficit is below the 3% required by the EU's Stability and Growth Pact and will total 2.4% in 2013. Debt totalled 73.4% in 2012. Finally unemployment is extremely low: 4.4% last year. According to an OECD study Austria, like its German neighbour, recorded a slight decrease in wage inequality (between 7 and 10%). Over the last two years the government led by Chancellor Werner Faymann has adopted several austerity measures in order to rise to the challenge of the international economic crisis. It notably made some cuts in public spending including in the areas of education and social aid. In 2012 a consolidation plan of public finances totalling 28 billion € was adopted. The government also nationalised two banks, took shares in another and strengthened four of its five main banking establishing via capital injections. On 26th June last the government announced the introduction of a 1.59 billion € plan over three years designed to revive the country's economy. Sectors like construction, child and healthcare are amongst the main beneficiaries of this public money. Last spring's flood victims will also receive financial assistance. Half of the 1.59 billion € is to be spent before 2014. "It is important to say that we are not taking money out on further debts," declared Vice-Chancellor Michael Spindelegger, who recalled that the government had not relinquished its goal of reaching budgetary balance by 2016. Just weeks before the election and after the collapse of the company Alpine Bau GmbH, the country's second biggest building business (6,500 employees), the government wanted to show the electorate that it was aware of their economic difficulties. Outgoing Chancellor Faymann is using his results as head of State in his campaign. "We have guaranteed one million jobs thanks to exports," he maintains. Stressing that capital is taxed less than labour in Austria he declared that he wanted to create an inheritance tax totalling more than one million €. Like his government ally the ÖVP led by Michael Spindelegger wants to consolidate the Austrian economy. However he is rejecting the idea of tax increases and is promising to reduce those weighing on businesses, reduce labour costs and make the labour market more flexible. He believes that public finances can be re-balanced by reducing public spending. The Vice Chancellor is suggesting a modification to the present retirement system by increasing the taxes of people who want to retire as early as possible and by offering tax rebates to all of those who accept to work longer. 3 - And what about the far right? During the election on 28th September 2008 the far right - the FPÖ and the BZÖ - rallied nearly one third of the vote (29%). They came out ahead in the Länder of Salzburg, Vorarlberg and Carinthia. As in all European countries the far right has, over the last few years, placed its xenophobic rhetoric to one side - without relinquishing however its discourse on the defence of the rights of "real Austrians" and its criticism of the Islamisation of society - preferring to promote socioeconomic themes which are the electorate's most important source of concern. The far right occupies the eurosceptic niche. Heinz-Christian Strache says he is pro-European but in his opinion this feeling has nothing to do with the European Union. "The Union has brought with it a project for peace, which is a good thing. Unfortunately however social peace is no longer guaranteed," he indicates adding "we do not want centralisation, nor a transfer of sovereignty over to Brussels. We want to take control of our economic destiny once more." He would like his fellow countrymen to be able to express what they feel about the debt crisis in Europe in a referendum. "Before the euro sinks like the Titanic, I shall request a referendum on the Economic and Monetary Union (EMU)." He even goes as far as suggesting the organisation of a popular consultation, "if the 28 are to develop into a super, centralised State, I would prefer an alliance with Switzerland," he maintained saying that he supported the entry of Serbia and Russia into the European Union. In March 2009, six months after the elections of 28th September 2008 and after the death on 11th March 2008 of Jörg Haider, who previously led the FPÖ (1986-2005), the chairman of the BZÖ of Carinthia, Uwe Scheuch tried to join forces with the FPÖ. The project failed however and after this the chairman of the BZÖ's parliamentary group, Josef Bucher took over as head of the party. He took the party along a liberal path before being challenged himself by several regional federations such as those in Styria and Carinthia where the BZÖ finally merged with the FPÖ. The party is struggling to survive. The Greens (DG) clearly show their goal which is to integrate the next government coalition and finally enter office. "It is our goal to reach a size that will enable us to form a majority with another party," said Eva Glawischnig Piesczek. Positioned rather to the right on economic and social issues the Greens have criticised the SPÖ on several occasions since they believe their reforms to be too weak. The party is divided between its right and leftwing. Its electorate is amongst the most qualified and has revenues over the Austrian average. Although the Greens have shifted to the right they differ from the ÖVP's electorate in that they defend more liberal values. According to a post-electoral survey on the regional election that took place on 5th May last in Salzburg the Greens succeeded in attracting 14,000 ÖVP voters and 12,000 from the SPÖ. On 27th October 2012 Matthias Strolz, a former ÖVP member created Neos-New Austria. The members of this liberal party notably come from the ranks of the Greens (or are former supporters) and the ÖVP. Neos-New Austria is fighting for greater citizen involvement, an autonomous education system, a 75% decrease in political party funding, the control of public finances (no further debt) and a reduction in taxes. The party supports a federal Europe. But the party which seems to be in the best position to disrupt the electoral arena and which might affect the result of the far right is the Team Stronach, founded on 27th September 2012 by Frank Stronach. Born Franz Strohsack in 1932 in Gutenberg an der Raabklamm (in the country's south), Frank Stronach left school at 14 and worked as an apprentice mechanic in a workshop before leaving for Canada where he made his fortune as the head of Magna, a car equipment company (which notably supplies BMW, Toyota, Hyundai and Peugeot) which is established in Aurora near Toronto. The business has 256 factories in 26 countries and employs 107,000 people. The fortune of its CEO was estimated in 2011 at 1.7 billion $ by the American magazine Forbes, which makes him the 21st wealthiest Canadian. Frank Stronach tried - unsuccessfully - to start a political career in Canada and stood in the Canadian general elections in 1988 under the banner of the Conservative Party (PCC) in which he was beaten. His daughter Belinda was an MP in the Canadian parliament in 2004 and after joining the Liberal Party (PLC) she became the Human Resources Minister in the government led by Paul Martin in 2005. Two BZÖ MPs (Christoph Hagen and Elisabeth Kaufmann-Bruckberger), one SPÖ MP (Gerhard Köfer), independents Robert Lugar and Erich Tadler as well as Stefan Markowitz MP joined the Team Stronach when it was created, which helped the new party to have a parliamentary group (led by Robert Lugar) and to enjoy room to manoeuvre in Parliament. It has one MP in the Federal Council (Gerald Zelina). The party's programme is a mixture of economic liberalism and euroscepticism. Although he says he is pro-European, Frank Stronoch is against the single currency and qualifies the creation of the euro as a "major mistake". He is suggesting the creation of a flexible rate euro, in other words a floating common currency that is pegged on the country's economic dynamism. In this system a Greek euro would only be worth 40% of a German or Austrian euro. Frank Stronach would also like to introduce a Marshall plan for the struggling economies of southern Europe. From a domestic point of view his programme focuses on three priorities: the reduction of the debt, the simplification of the tax system and the fight to counter bureaucracy, which he qualifies as "obese". He maintains that Austria is "overgoverned, "overbureaucratic" and "overadministered" He supports reductions in business tax and the introduction of a flat rate on VAT, income and business tax ranging between 20% and 40%, which in his opinion would stimulate the creation of jobs, reduce bureaucracy and revive economic growth. Frank Stronach wants to introduce a new chamber of representatives that would be formed by citizens selected at random and to reduce the number of federal mandates for the members of his party to two. Supportive of selective immigration he maintains that "only those needed in Austria and who can improve the common good should be allowed to enter." Frank Stronach has set the goal of winning at least 10% of the vote in these elections. "It is the first time in 50 years that people have the chance to vote for someone new." According to the polls the far right parties, FPÖ and BZÖ are the ones who will suffer most from the entry of the Team Stronach, qualified by Heinz-Christian Strache as an "artificial creation designed to upset the political arena." Frank Stronach refuses to be compared to Jörg Haider. "Firstly I am an entrepreneur with social fibre who has created many jobs. Secondly I am against any type of discrimination. Jörg Haider probably helped to change the system but apart from that I have nothing in common with him," he stresses. "Frank Stronach uses an anti-party and anti-establishment feeling and is succeeding rather well," declared Markus Wagner a political expert at the University of Vienna. "Many Austrians think that Frank Stronach has an impressive life and he talks about things that interest people but his young team will have to show more before it becomes a major factor in national politics," maintains David Pfarrhofer of the pollster Market. 5 - What lessons can be learned from the four regional elections in 2013? Since the beginning of the year the Austrian political forces have been able to gauge their successes four times in regional elections. Of course the context and the issues at stake were different in each Land and these elections cannot be seen as premonitory of the elections to come. They do throw light however on the present political context in Austria. The first observation is that the ÖVP has maintained its hold in the Tyrol (28th April) and in Lower Austria (3rd March) where it maintained an absolute majority - these are two regions it has governed since 1975. It won the Land of Salzburg (5th May) where the SPÖ suffered a serious defeat after the financial scandal that upset the local government and which led to this early election. The regional elections were not very satisfactory for the SPÖ. The only good news was that on 3rd March it took back Carinthia, an industrial, working class Land which it governed from 1945 to 1999. The far right has declined in Lower-Austria and in Tyrol. It made slight progress in Salzburg but collapsed in Carinthia. The Freedom Party of Carinthia (FPK) led by Kurt Scheuch suffered defeat winning 16.85% of the vote. The BZÖ won 3.80% of the vote. In this Land the far right lost 26.05 points between 2009 and 2012. Finally the Team Stronach achieved varying results: 11.8% in Carinthia led by Gerhard Köfer, where it took votes from all parties but especially from the far right; 9.8% in Lower-Austria and 8.3% in Salzburg. In the latter two Länder it entered into the regional government. However it failed in Tyrol where it won 3.4% of the vote. According to a most recent poll by Spectra, the SPÖ is due to win the elections on 29th September next with 29% of the vote. It is due to pull ahead of the ÖVP which is due to win 27%. Together the two parties would have the absolute majority and might be able to continue their alliance as head of the State. The FPÖ would take third place with 20% followed by the Greens, 15% and the Team Stronach, 8%. The BZÖ is flirting with the 4% mark, vital to be represented in the National Council. Eight Austrians out of ten (80%) say that they will definitely go to vote.